Ownership structure of a major Chinese producer is rather complex, and it has been recently changed. But the central company, serving as a base of brewing business is still China Resources Snow Breweries, Ltd. (CR Snow below). CR Snow has a head-office in Beijing and it is registered as an investment holding on the Virgin Islands. Till March 2016, 49% of CR Snow stake belonged to SABMiller. CR Snow operates as a subsidiary of state-owned enterprise China Resources Beer (Holdings) Company, Ltd. (CRBHC below). In its turn, CRBHC is a part of a multi-profile commercial and industrial group including retail, food and beverage business. CRBHC as a managing company was founded in 1 September, 2015, resulting from the transformation of company China Resources Enterprise, Ltd. Then, its rights for non-beer brands were sold for $3.6 billion to higher China Resources (Holdings) Company Ltd. In general, all subsidiaries and companies, are in the final analysis parts of a large group of companies under China Resources National Corporation which is controlled by China’s government. CR Snow dealt with buying and construction of breweries though a couple of dozens of regional subsidiaries. 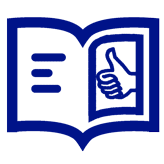 The subsidiaries are easy to differentiate by geographical attribute in their name. For example, China Resources Snow Breweries (Sichuan) Co., Ltd. and others. 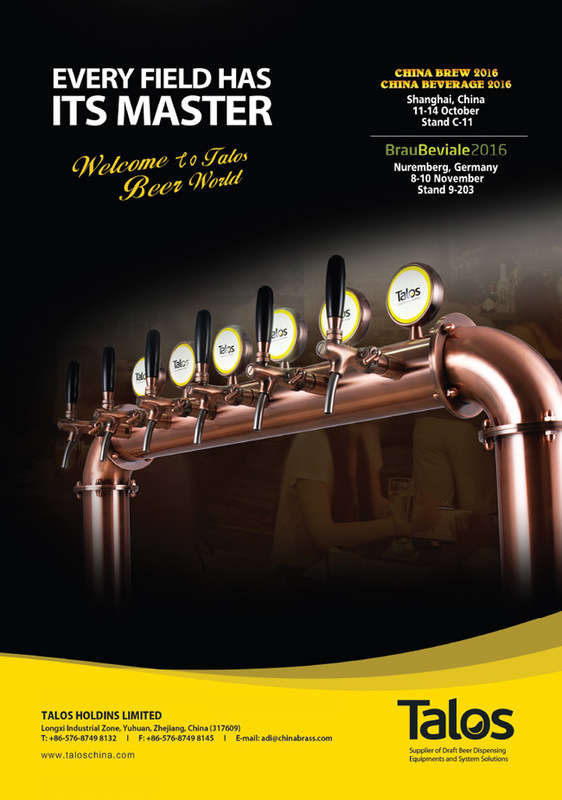 The subsidiaries are responsible for operational activity and specialize in beer production and distribution. Each of them usually has several production sites. The company has been in the beer business in China since 1994 as joint venture of South African Breweries (49%) and China Resources (51%). However, if we trace CR tradition, we’ll see it roots back to 1934, when state enterprise Shenyang Brewery (Liaoning Province) was founded. In 2015, SAB Miller decided to sell its stake to the Chinese partner, in order to complete a deal on merger with AB InBev. The deal is much spoken about in business press, so we will not go into detail. 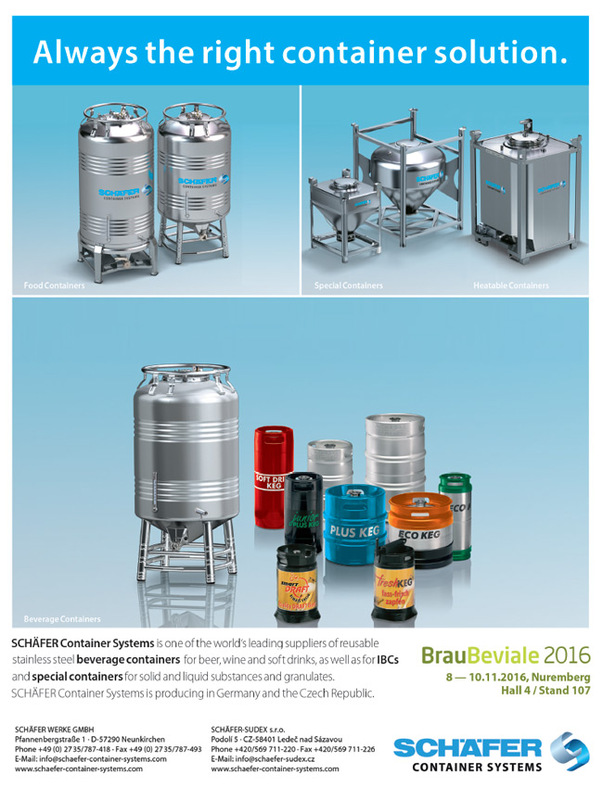 CR Snow is the only brewing company in China which can be considered a fully national manufacturer. The company is confident in its coverage area, which makes its work stable even in difficult times. 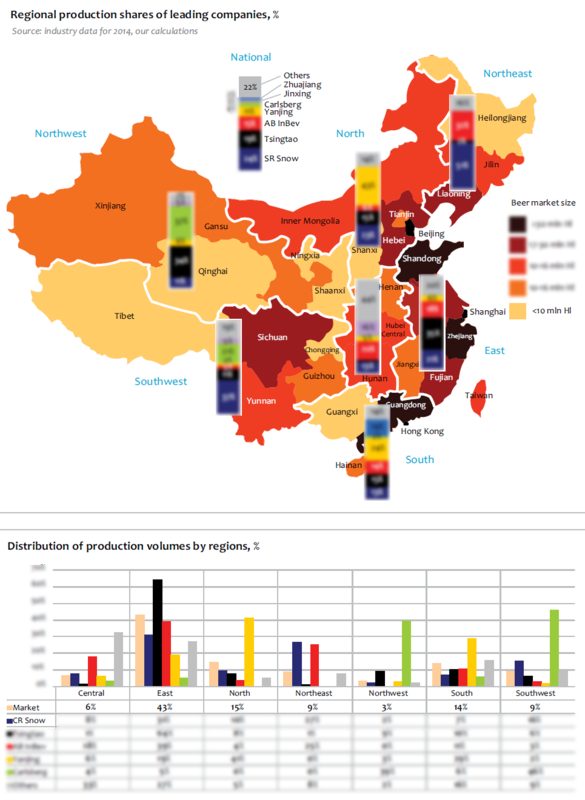 In total, CR Snow includes 97 breweries in 25 administrative areas of China. 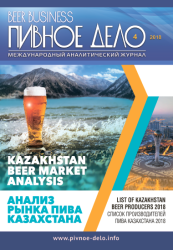 The net capacity of the breweries amounts to 223 mln hl. 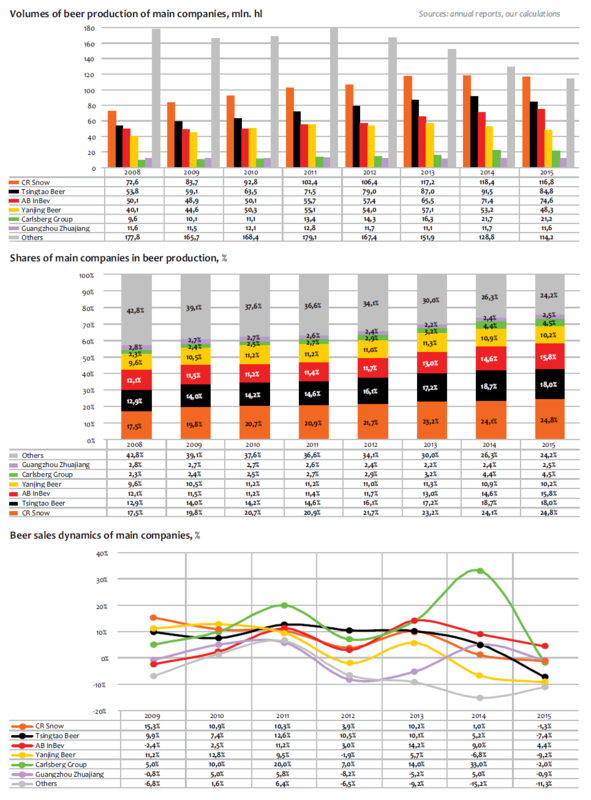 Due to its extended and qualitative distributions, CR Snow can, basing on the consumption dynamics and competition situation, achieve growth in beer sales in certain regions and offset the decline in others. These growth points change every year. For the first half of 2016, according to the press reports, the company managed to raise sales in the southern and southeastern regions of the country. Despite the industry problems, CR Snow sustained the stability of sales volume. In 2015, they fell only by 1.3% to 116.83 mln hl, and in the first half of 2016, it went 1.94% down. Unfavourable weather was again cited as the reason for the decline by the company, and the economy continued to be sluggishly affected. The sales turnover in 2015 grew by 0.98% to HK$ 34.8 billion*. However, in the first six months of 2016, revenues declined along with volumes. According to unaudited financial performance, (which was cited in yuan) and our educated estimates, they reduced by 1.8% to 15.21 billion yuan. * the revenue was higher and EBIDTA was lower if we take Discontinued non-beer operations into account. Net revenue of CR Snow in 2015 increased by 1.3% to 4.4 billion, and in the second half of 2016, under our estimation the growth has reached 43.6% to 1.5 bln yuan. Whereas, the main profit increase took place in the first quarter of 2016. Thus, we can see a rather slow gradual reduction of volumes in liters which looks not bad against the market decline. The average price for CR Snow in 2015 increased by 3.3% which obviously allowed increasing the revenues. In the first half of 2016, the proportional reduction of the revenues can be attributed to the competition growth and the resulting high promotional activity of the company. The economy proposals for consumers smoothed out the positive influence of the product mix. The profit growth of CR Snow during the first half of 2016 was connected to lower production cost as well as to reducing sales and distribution expenses. The cost price was cut due to reduced overheads in the face of the industry downturn, among other things due to slip in prices for brewing barley. Unlike other major Chinese companies, the product range of CR Snow was almost fully represented by a monobrand. Beer Snow appeared in 1993 almost simultaneously with the joint venture forming. 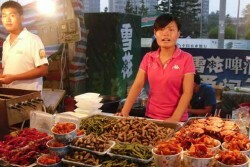 At that time it was a small regional brand which started to be bottled at three CR Snow breweries in the north of China. 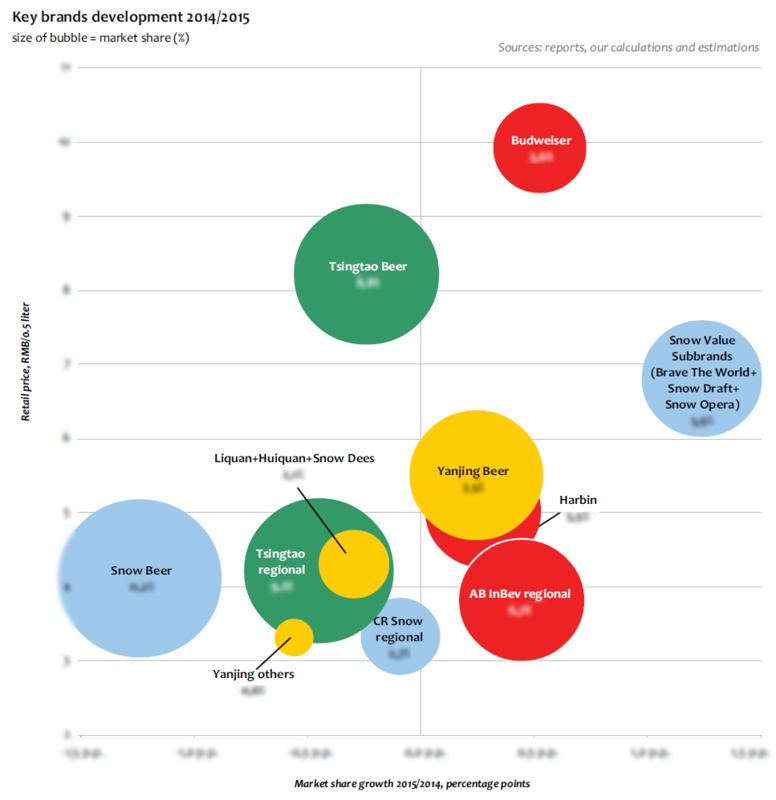 It initially focused on creating regional strongholds, acquiring brewers and brands in high growth areas. The company developed sales of nearly 30 regional sorts at the acquired businesses. However, in order to achieve the leading positions the marketing resources were targeted at Snow and it rapidly became a strong national brand. In 2005 Snow became the largest beer brand having left Tsingtao behind. At that time Snow accounted for a half of the company’s sales. 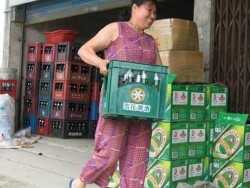 In 2006 CR Snow spurted in the lead on the Chinese beer market, and brands Snow share reached 57%. Since 2008 it has become the largest single beer brand by volume worldwide, having outrun Bud Light. By that moment, the share of Snow in the total sales volume of the company has risen to 84%. 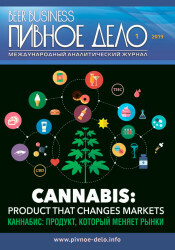 By 2010, the sales of Snow exceeded 100 mln hl., and its share in the portfolio reached 90%. Since then, it has been hovering around that figure. The rest accrues to a dozen of the remaining regional brands. Thus, over the last decade, company CR Snow has for the first time managed to create a really national brand, which is the leader or one of the most significant brands in any province. One cannot say that consumers are very loyal to Snow. For instance, according to Gfk survey carried out in May 2015, 13% of the respondents called Budweiser their favorite brand, which is three times less than Tsingtao audience. But the affordable price, unprecedented level of national distribution, and powerful promotion enable Snow to exceed Tsingtao by 38% as at the end of 2015. The flagship trademark encompasses a lot of subbrands, which vary greatly by their price positioning and target audience. 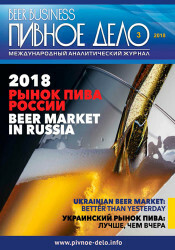 Judging by the company’s reports, the major economy subbrand Snow Beer and about a dozen of regional brands in 2012 accounted for 71% of the company’s sales, and the middle-priced and premium brands, 29% accordingly. 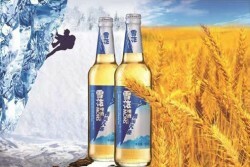 In 2015, Snow Beer and other cheap brands costing less than 5 yuan for a bottle, gave 49% of sales. 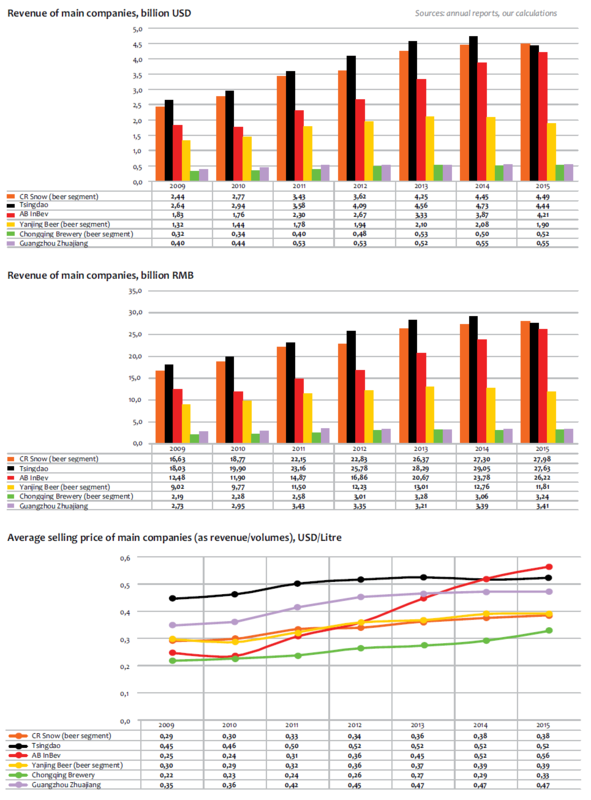 The remaining 51% is marginal part of the portfolio consisting of three big subbrands with communications based on various aspects of the national pride and culture. 1) Middle-priced subbrand Snow Brave The World was launched in 2008. This title is also translated as Snow Globe Trekker. In 2015, this beer cost 5-7 yuan for a bottle. The marketing policy was based on arranging expeditions to explore the Chinese geography. 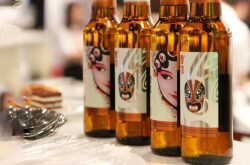 2) Besides, in 2008, premium brand Snow Draft Beer (9-12 for a bottle) appeared on the market. Thus, the company became one of those who started a fashion for draft beer in bottle. A major topic in the brand promotion is the Chinese architecture. For example, the brand acts as event organizer and sponsor in photo contests dedicated to the national cultural structures. 3) Superpremium subbrand, the name of which is sometimes translated as Snow mask or Snow Opera, was launched in summer 2013, in response to the rapid import growth. In Chinese, this word means grease paint samples or albums of stylized masks of the traditional Chinese actor, that is, the name reflects the essence of Chinese opera culture. The retail price of Opera exceeds 25 yuan for a bottle. According to SABMiller report, brand Snow Brave The World has continued to grow by double digits and now represents over 20% of CR Snow’s total volume, and over 27% of NPR. At the same time it was reported that together Snow Golden Draft and Snow Brave The World now account for 23% of Snow’s total volumes. Subbrands are represented in the growth segments of the on-premise channel, with good penetration of night outlets in targeted cities. The marginal subbrands sales revenues are obviously at the same level with the major economy brand Snow Beer. One can say that due to the precise price positioning, wide distribution, and the effectivity of national promotional campaigns, the marginal brands CR Snow manages to take the share from other Chinese producers. Though in these market segments the company is facing a growing pressure from the international brands. Middle-priced Snow Brave The World is in the first place competing with other national manufacturers, but soon it can face the growing popularity of Tuborg. Premium Snow Draft keep a price distance from Budweiser and is likely to take Tsingtao’s share. 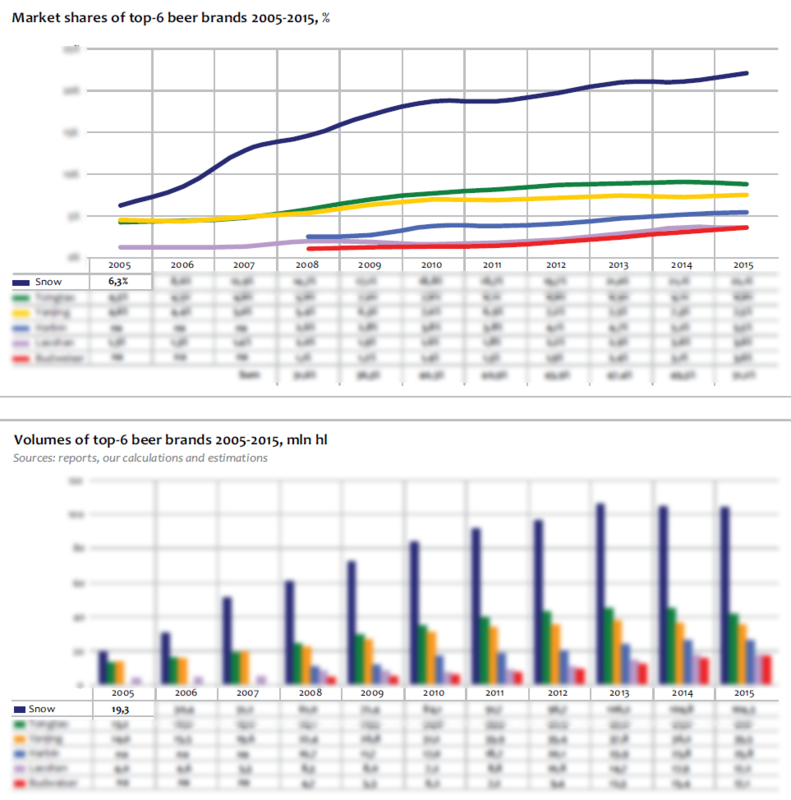 But the share of Snow Draft Beer, as we can see, is only a few percent, despite the market presence since 2008. That is, the growth potential seems to be limited. Like other market leaders CR Snow focuses on the can segment. The report for 2015 says the revenue growth was driven by an increase in one-way packaging volumes, and the continuing premiumization of the portfolio. On the one hand, cans solve the problem of returnable package and raise the production manufacturing. On the other hand, cans are handy to sell in multipacks at promotional price, which the company has been doing ever increasingly.